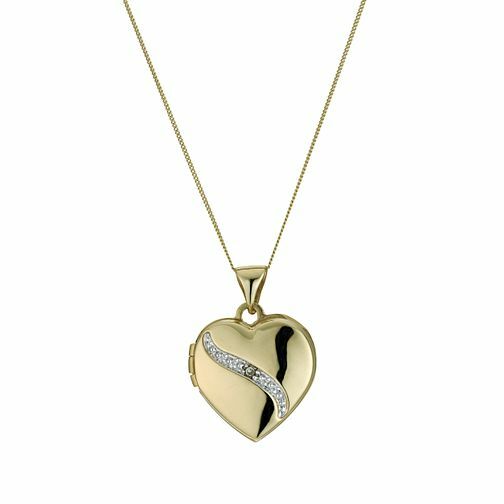 9ct yellow gold 18" heart shape locket featuring diamond set detailing. Keep a picture of your loved ones close to your heart. 9ct Yellow Gold Diamond Set Heart Locket is rated 3.8 out of 5 by 5. Rated 1 out of 5 by Anonymous from Heartbroken! There is no doubt this is a beautiful piece and I was ecstatic when it was bought for me at Christmas as a gift. However only a month later the dainty chain soon became very faulty and suddenly when I was out the other day, I noticed it was broken around my neck! The locket was missing and I couldn’t understand what had happened at all. There was no tugging or pulling of the necklace whilst around my neck; it was always handled with care as I do all my jewellery; so for this item to have so easily broken is very worrying and heartbreaking for me as I will now never get it back and have lost something both expensive and sentimental. Very disappointed. Rated 5 out of 5 by Anonymous from Stunning This necklace was brought for my nans 70th Birthday from my late grandad. It looks beautiful. The chain is dainty and the locket is eye-catching. The diamond swirl adds something special. All in all I'm very happy with the purchase and the amazing customer service received at the Rugby branch from staff (where I collected it). They made it a pleasant shopping experience at such a tough time (my grandad ordered before he sadly passed away).